Alright probably my last for this GB, and a proper P-51 build . 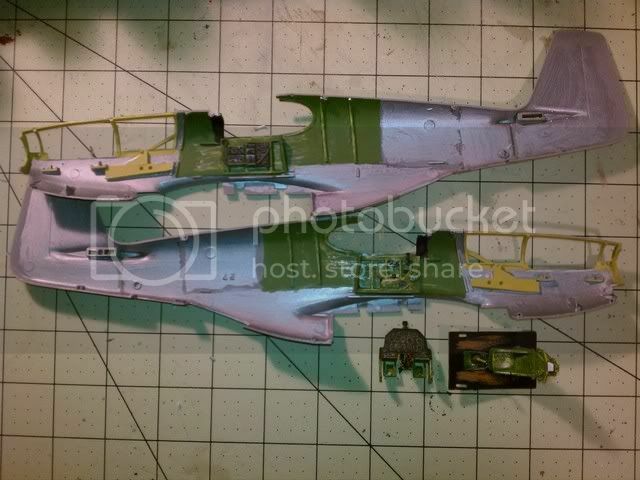 Again, I start with the ol' Revell "B" but this time its the Revell/Germany release but labeled as a Mustang MKIII. I have a spare standard canopy, so will not use the Malcolm Hood. I really want this to come out nice, but in a not so nice way. 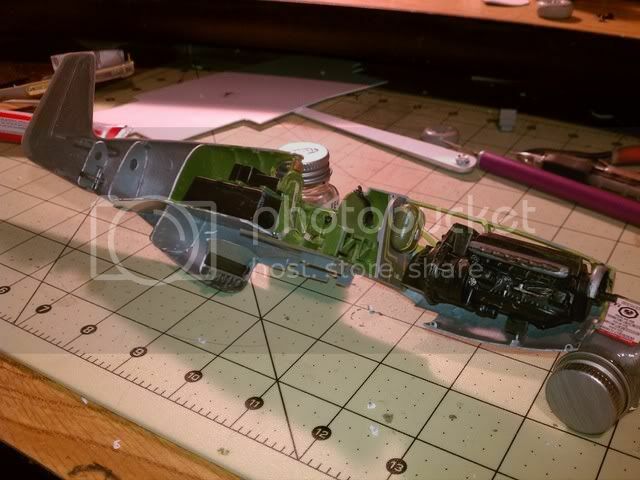 I am going to try my hand at a bit of weathering, and distressing. I want it to look a bit rode hard and put away wet. 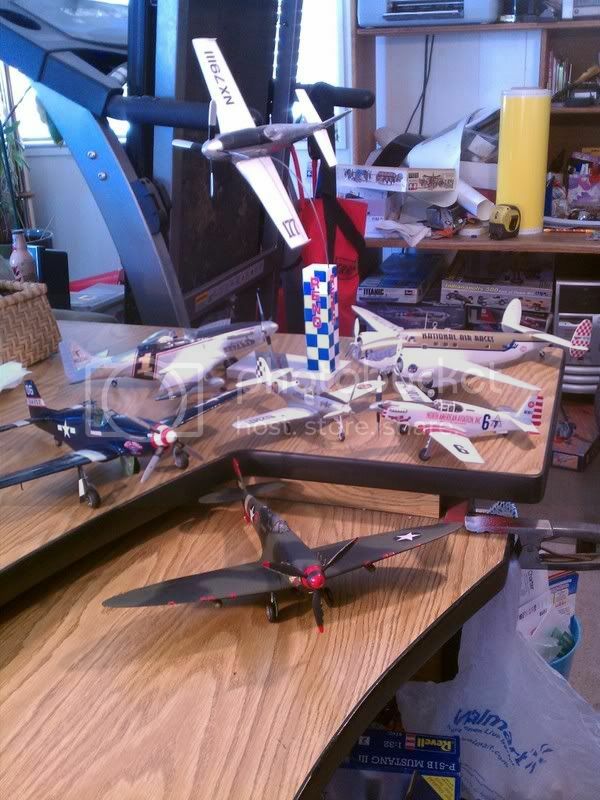 I will probably display similar to my "Full Bird", on the ramp, canopy open, flaps and elevators down (I was really happy with my flap treatment on that one). PLEASE FEEL FREE TO OFFER UP AN OPINION!!! 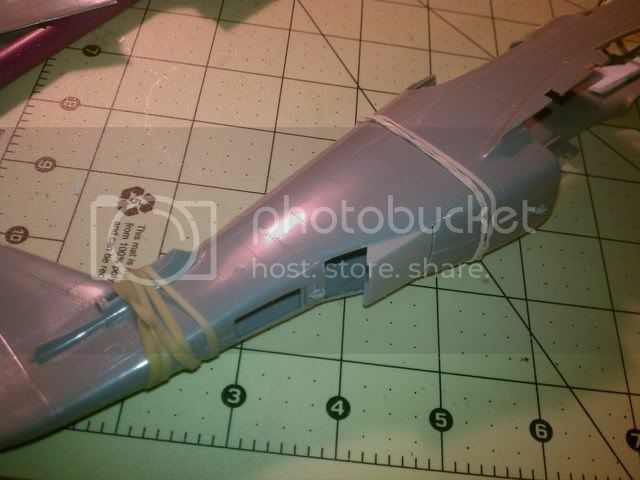 I hope to also add some exhaust trails on the fuselage, and gun soot as well. 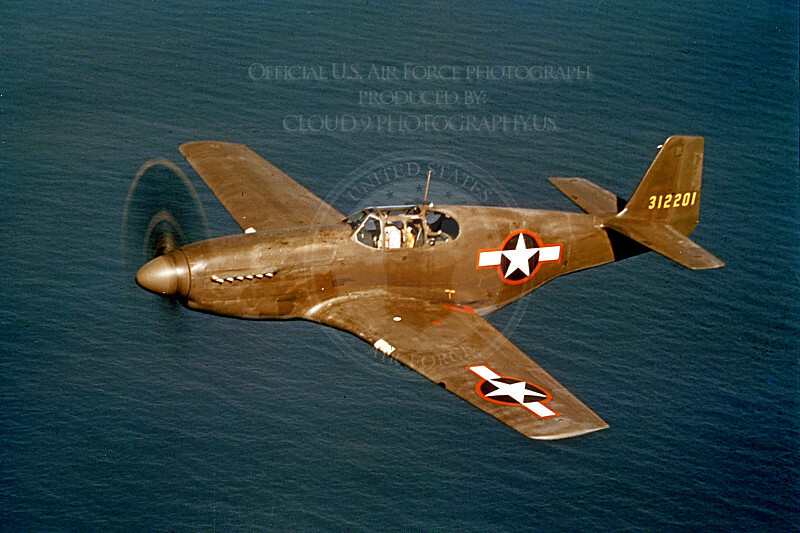 I am considering single white stripes on the wings only, but need to come up with the time frame that those were added, to see if it coincides with the red striping around the insignias. 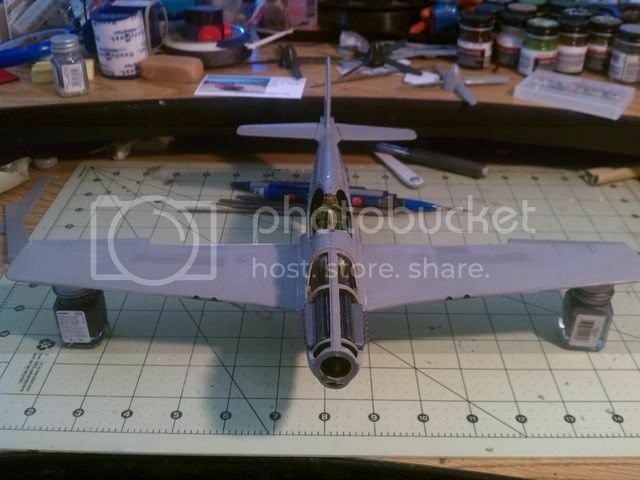 I am also considering rebuilding the back portion of the wheel wells to show the wing spar a bit more correctly, finding a good picture of the internal fuel tank area, and possibly modify that, and add the landing light in the wing. OK...soooooo....seems that "B"s never were in theater with the red outlined insignias.....learn something new everyday. I've always wondering how good is this kit. Now, that you are building one I must say I'll be following this very closely. So, keep up the good work. Wow, you are a machine! Should be fun to watch, though I can't answer any of your questions unfortunately. 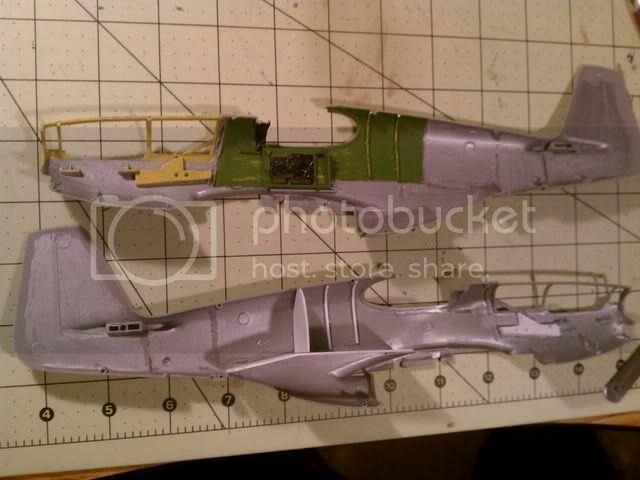 This is the same old Revell kit just reboxed, different decals (both USAAF and RAF) and with Malcolm hood only. I actually like them alot. 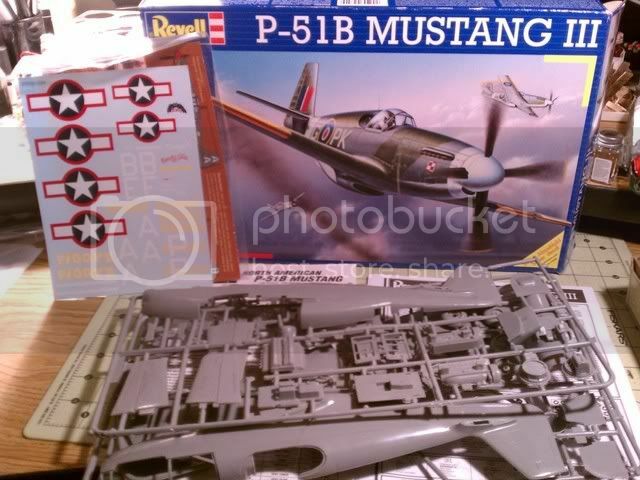 I know just enough about Mustangs to be dangerous, and yet not enough to pick the Revell kit apart. I personally am looking at 5 of them within arms reach . I did notice this newer produced kit has a bit more flashing and where the sprues attach to the parts are a bit bulky. The engine is a bit lacking, but oh well. Like I said, they work for me. Thanks a heap Kev!! I just love building these things! Mostly research this weekend, but I did get a tiny bit accomplished. I added some styrene stock to back half of the engine bay to give a bit of a hint that the engine mount/cradle are there. Started plotting and planning for modifying the aft cockpit for the addition of a scratch built fuel tank and relocating any other gear. Also started plotting and planning for upgrading the radiator scoop area. Here is what I have done thus far on the scoop area. 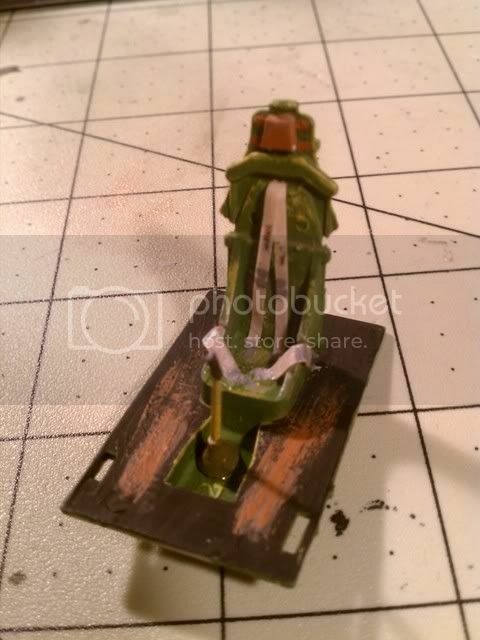 Enlarged the radiator exhaust outlet, and added the the vent door (left over from my scoopectomy on my Galloping Ghost Hasegawa kit). I knew the original hole looked odd, but had no idea it was so far off. and you make it look so effortless and yet I know you place a lot of hard work into it..
As of right now my BIG dilemma is the proverbial O.D. shade argument. FS34086 Green Drab works well for the 'factory fresh' version of Dark OD 41. 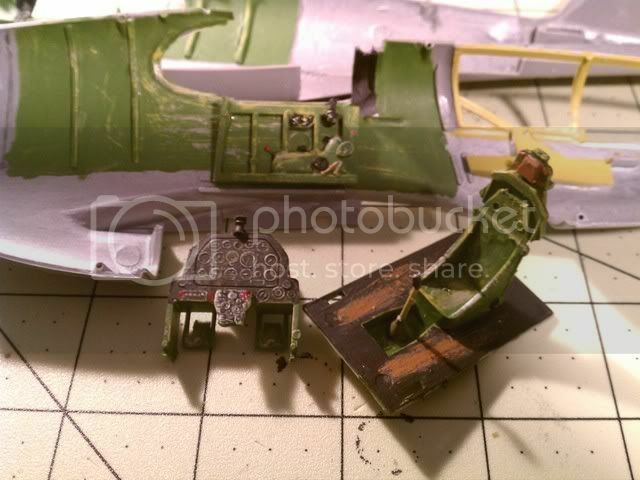 Testors #1165 "Flat Olive works well for faded areas of that color, as does ANA 613 Dark Olive Drab. Both can be mixed with the FS 34086 for other faded effects. Great start! Looking forward to watching this one come together. Well got a bit more done yesterday, sanded the wings, and glued them up. 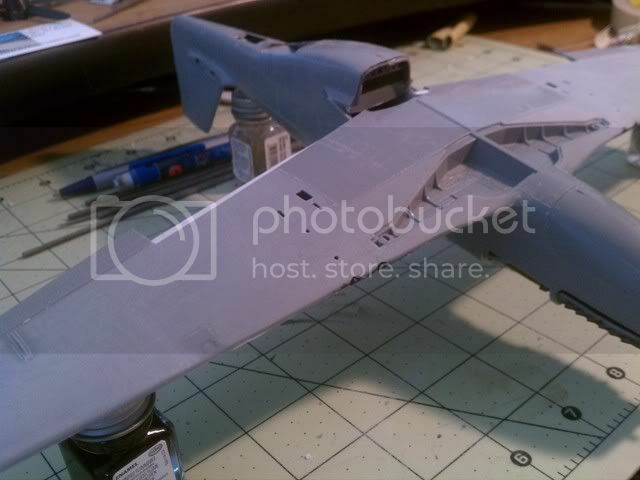 Prior to that though, made the ejection holes in the bottoms of the wings, and added some round stock for gun barrels. 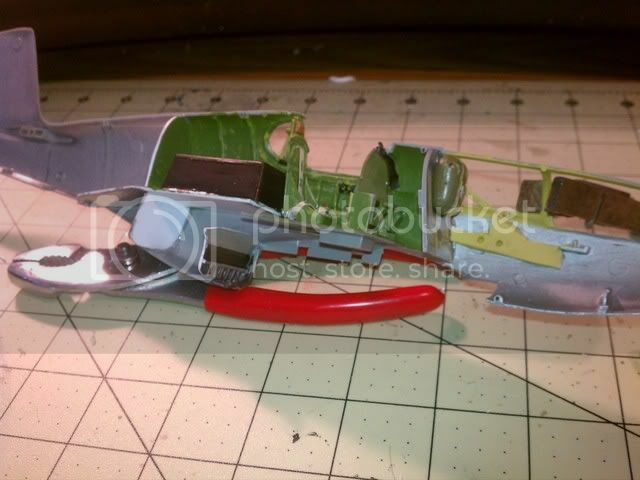 Hope to finish up the flaps and get some paint on it over this week.... I chickened out on wheel wells....maybe on the next one. 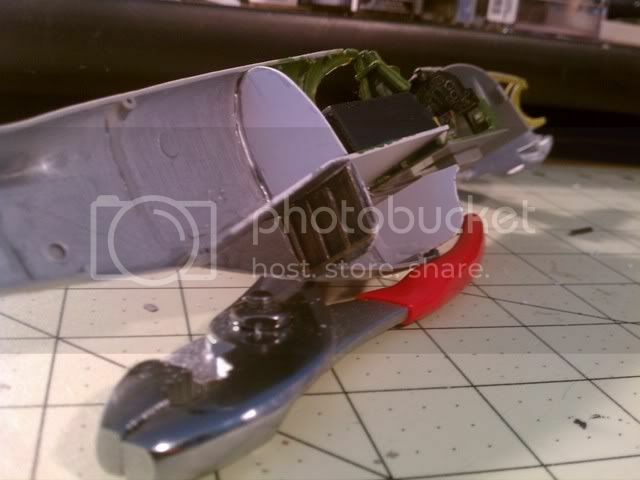 I used a method for attaching the wings I saw somewhere, attach the top portions to the fuselage, to insure a nice seam, then attach the lower half....WORKED GREAT!!!! !